Enjoy the best of Queensland on this Rail & Cruise holiday. Discover tropical Cairns then escape to the Great Barrier Reef for 3 nights. Exclusive to Holidays of Australia and the World. Snorkel over colourful coral gardens, stroll golden sandy beaches and wander rainforest trails. Small ship cruising with a maximum of 44 guests onboard, experience the World Heritage-listed reef from private moorings away from the tourist crowds with the expedition experts. Be guided by an expert Marine Biologist on glass bottom boat and snorkelling tours. 1 night aboard the Spirit of Queensland travelling from Brisbane to Cairns in a RailBed seat including main meals. Transfer from Cairns Rail Terminal to your hotel. 1 night stay in Cairns at the Hilton Cairns including breakfast. Transfer from your hotel to the Cairns Cruise Terminal. 3 nights aboard the Coral Expeditions II cruising the Great Barrier Reef. Includes on board meals. Transfer from the Cruise Terminal to your hotel. 2 night stay in Cairns at the Hilton Cairns including breakfast. Full day Classic Kuranda tour including Kuranda Scenic Railway. Transfer from your hotel to the Cairns Rail Terminal. 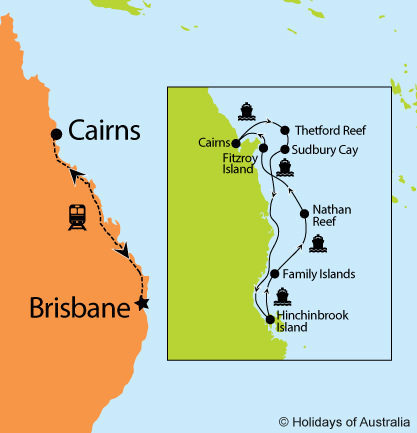 1 night aboard the Spirit of Queensland travelling from Cairns to Brisbane in a RailBed seat including main meals. Above pricing is based on the arrangements listed under package inclusions only. Itinerary & Pricing is subject to change or substitution. ^Save $100 per person valid on new bookings until 31 Mar 2019.